I know change is a part of life, and ultimately learning to adjust to new developments and meet new people will be good for my daughter. But as a mom, it's hard to see fear and anxiety welling up in my child's eyes. There were tears the day we announced we'd bought a home. I don't mean the tears I cried at the closing when I held the keys to my first house. Or the manly glisten in my husband's eye as it sank in that he was finally a homeowner. I mean the frustrated, angry, helpless tears of a 7-year-old who was being told she was leaving all her friends (not to mention the 4' Lothario who'd captured her heart) to start over in a new town. What seemed like a joyful milestone for us was interpreted by our daughter as Mommy and Daddy conspiring to ruin her life. I don't know if it was out of guilt or protectiveness, but at that moment I embarked on a campaign to ease her anxiety and make her transition as seamless as possible. And now that she's eased into the school year, I'm relieved to say so far, so good. Here are a few lessons I learned as I held her tightly through the frightening process. We're All "The New Kid"
Over the summer, my daughter saw a girl at the pool she recognized from her new town camp. "Go say hi," I urged her, but she shyly backed away. Flash forward to the second day of school. While picking up my daughter, I spotted a mom I had recently chatted with at the pool. "Go say hi," my daughter suggested, her eyes growing wide as I awkwardly made excuses. In the end I did what my daughter so often does -- I grabbed her hand and dragged her along with me. (After all, everyone's friendly when the kids are around!) We're all new in this town, and it's not always easy. The last week of June was pure torture. My head was spinning as I alternated between packing up our old apartment and managing a stampede of contractors marching through our new home like ants with power tools. We hadn't moved in yet, but I was determined that my daughter would attend summer camp in our new town. 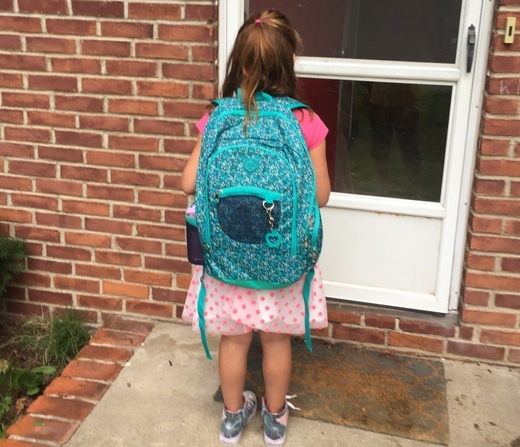 I desperately wanted her to see a few familiar faces when school started, even if that meant driving her back and forth between towns each day, until we moved into our new home. But every stressful moment was worth it when, on the first day of school, my daughter said with a big smile, "Guess what, Mommy? There were five girls from camp in my class!" When we moved away, I promised my daughter I'd try to arrange play dates with her old friends. Unfortunately, it was summer, and with people away on vacation, it was too hard to coordinate. I'm still determined to make plans with her closest friends, but I can see already that a lot of her more casual friendships (including that with Romeo) are probably going to fall by the wayside. The reality is that our lives are here now, and her calendar is already getting filled with school events. It's hard at her age to build a life in two places. I didn't want my daughter to go through this transition alone... and she's not. I've volunteered to be her Class Parent. While I already can tell it's going to be work, my daughter was infinitely relieved to know I'll be around, and that I'll be learning about her new school with her. I'm sure by Valentine's Day I'll be school-partied out, but it means the world to my daughter to know we're in this together, and that one of the familiar faces she'll be seeing around her classroom will be mine. I know change is a part of life, and ultimately learning to adjust to new developments and meet new people will be good for my daughter. But as a mom, it's hard to see fear and anxiety welling up in my child's eyes. I'm glad I can be there for her... until she realizes mom is uncool and tries to ditch me at the crosswalk. This post originally appeared on the blog Mommy A to Z. Follow Mommy A to Z on Facebook and Twitter.